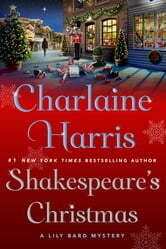 Charlaine Harris's beloved mystery series featuring Lily Bard. In Shakespeare’s Christmas, Lily heads home to Bartley, Arkansas–always an uncomfortable scenario for the introverted Lily­–for her sister Varena’s Christmas wedding. But Lily has more to worry about than being a bridesmaid for a sister to whom she’s no longer close. Soon after she arrives in Bartley, Lily’s private-detective boyfriend shows up too, and not just for moral support: He’s investigating a four-year-old unsolved kidnapping. Try as she might, Lily can’t help but get involved when she discovers that the case hits dangerously close to home–for Varena’s new husband is the widowed father of a girl bearing a remarkable resemblance to the vanished child.